Hello everyone and welcome to my website www.afaulknerart.com! This is my first website featuring my work and I’m excited to share it with you here. I’m a largely self-taught artist currently living in Inverness, Scotland and having only recently moved here I’m looking forward to exploring the area and capturing the beauty of the region. Just a bit of background to me, I currently work in NHS Highland as a trainee orthopaedic surgeon dealing with patients who mainly have injuries, joint problems and joint pain – basically a real mix of people that makes the job interesting and rewarding. 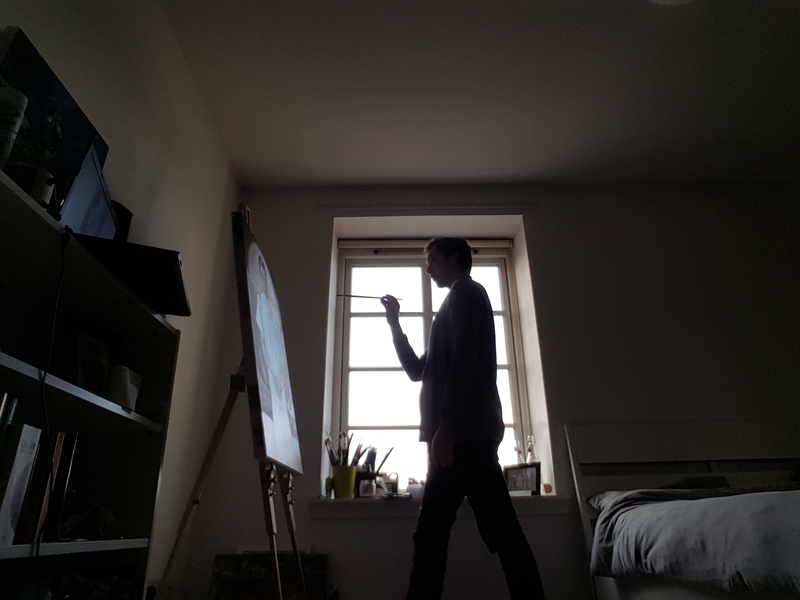 Art is something I have enjoyed since I was very young, and has been part of me one way or another as I’ve grown up, from drawing the Solar System in Primary School, to oil painting in GCSE, drawing copious manga sketches and attending life drawing at University. I was also absolutely obsessed with watching Bob Ross on TV – I only ever painted two of his tutorials but I was absolutely mesmerised by watching someone complete a work of art in such a short period of time. 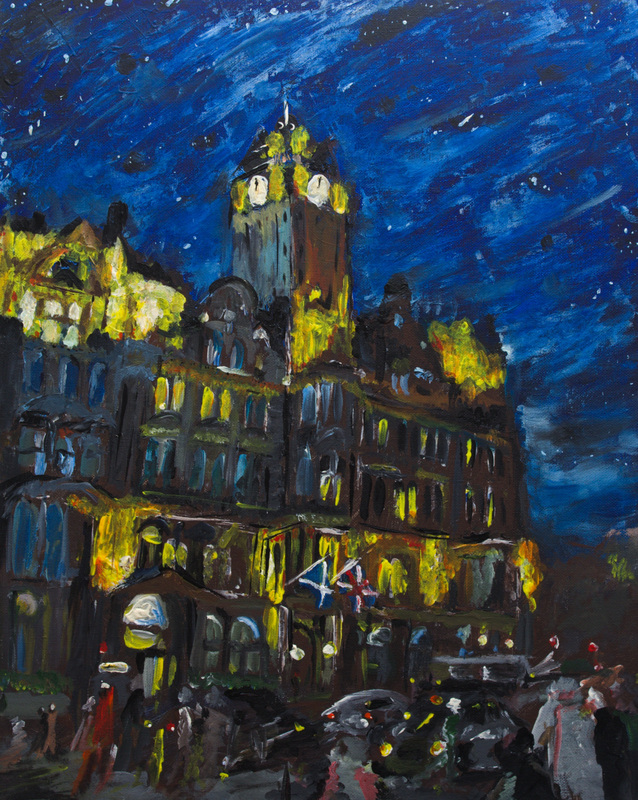 Over time, medicine became my focus however after a long hiatus from art I returned to painting in 2016 and painted “Midnight at the Balmoral” in acrylic which reignited my artistic juices. I have since discovered painting is an excellent complement to my day job. I’m still searching for my artistic voice – however I have taken lots of inspiration from the impressionists, the art of Van Gogh and the bold colours of artists like Matisse. I find night scenes particularly interesting due to the variety of colours conjured from artificial lights and how impressive the sky can look in those moments the sun is about to rise or set. I also thoroughly enjoy painting people and I’ve done a few studies in a number of styles to experiment. My current process of painting faces involves a lot of frustration followed by immense satisfaction once complete. Bones and Brushes is the name of my own blog and will feature anything and everything from new works of mine, old works, art I particularly like, maybe even art I don’t like or even the random mish mash of thoughts between orthopaedics, trauma, art and everything else in between. Who knows, I may find my voice at some point too. I hope you enjoy what you see if you have any questions please let me know! New articles and paintings coming soon! Subscribe to Bones and Brushes below.